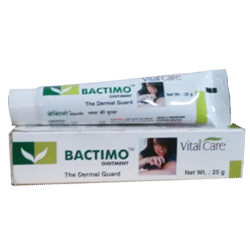 Buy Bactimo Ointment Treats Dermatitis, itching, eczema, bacterial & Fungal infections. Vital Care - Worldwide Shipping. Prompt relief in itching, dermatitis, acne, rashes, boils & in wound dressing. Powerful antibacterial and antifungal properties of manjistha, haridra, neem with shuddha gandhak to prevent and clear infections. Offers soothing, regenerative healing properties of aloe vera in cuts, burns & scratches. Inclusion of medicated ayurvedic oils ensures faster recovery in eczema & acute or chronic skin ailments. Dermatitis, itching, eczema, bacterial & Fungal infections. Apply gently over affected parts 2 to 3 times a day or as directed by the physician.